If you need to see a doctor or fill a prescription before you have received your insurance cards, follow the instructions below to expedite your access to care. Note: ID cards are not issued for vision or dental services. 2. 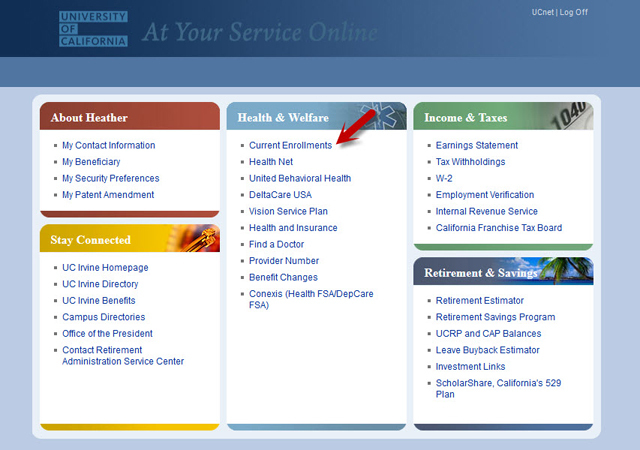 After 48 hours, verify your enrollment on At Your Service by going to Health & Welfare, then Current Enrollments. 3. Call your health plan's member services number and identify yourself as a new member and a UC employee who is calling to verify eligibility to access services. If you are active in the member system: Request your member ID and an ID card to be sent. If you are not active in the member system: Your enrollment may be expedited by requesting that the customer service representative access the UC Carrier Eligibility website to locate your enrollment and update your membership. Once your enrollment is updated, the representative can provide you with your member ID and group ID. If the customer service representative cannot locate your enrollment, contact Human Resources at 714-456-5736 to update your eligibility. Please allow up to 48 hours for this update. Ensure coverage for prescriptions: Ask the representative to inform the pharmacy unit of your eligibility. Confirm provider and pharmacy access: Ask the representative how long it will take for your healthcare provider and pharmacy to access your new member information. This usually takes about two business days.